This project packs a solid punch. From the full kitchen area nestled under the pent roof, to the patio below complete with drainage system for rain or shine enjoyment – there is a lot to take in! 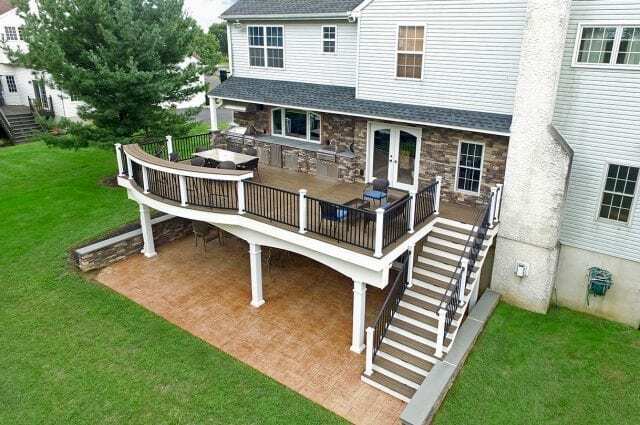 Starting on the deck, we utilized Trex’ low maintenance decking to really set off this nice open expanse, it is an amazing product that allows us to heat & bend the deck boards to create both the curve on the deck, and the high-top counter! The homeowner is now equipped to cook a full Thanksgiving meal on their new outdoor kitchen, with plenty of space to host the whole family! Below, we were able to utilize stamped concrete for the patio, a great cost-efficient option to finish out any project!